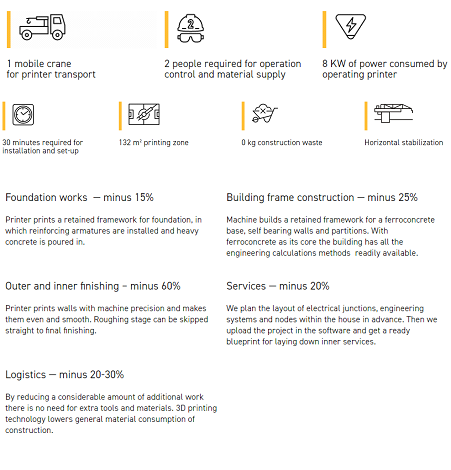 Several companies around the world have explored 3D printing to such an extent that affordable housing is able printed out of concrete in under 24 hours. The printer is based on the principles of contour crafting—a process that 3D prints large-scale objects layer by layer. American company Apis Cor recently used its 3D-printer to lay down concrete walls on a test home at a site in Russia, printing out a 400-square-foot or 38 square metre house. As can be seen in the above video, the printer resembles a small crane that lays down layer upon layer of a concrete mixture that the company says can last for 175 years. After the walls were printed, the machine was removed, and a group of contractors installed insulation, windows, appliances, and the roof. The company says that it can build and furnish these small houses for a cost of about $10,000 USD. Chinese construction company HuaShang Tengda have used a 3D printer to create a 400-square-meter, two-story house in a month and a half. Beijing-based HuaShang Tengda is a major competitor of fellow Chinese construction company WinSun, who have 3D printed a six-story apartment building and a mansion. Like Apis Cor, HuaShang Tengda printed their two-story villa entirely on-site. However in a unique process that looks quite different from other 3D printed construction techniques the HuaShang Tengda team first erects the frame of the house, complete with reinforcement bars and plumbing pipes, and then prints over them with their gigantic 3D printer. The technology, according to HuaShang Tengda, was developed entirely in-house and is controlled by custom-designed software that consists of four “systems”: an electronic ingredient formulating system, a concrete mixing system, a transmission system and a 3D printing system. The versatile printer, the company says, can be used to print buildings of any size and shape, including high-rise apartment buildings as well as structures with unconventional shapes that wouldn’t be feasible with other construction methods. The application of the technology has already caught the attention of many organisations around the world who can see the obvious benefit in using the approach to quickly build robust low cost housing for victims of natural disasters.